The problem with basing metric/decimal on the day is that the length of a earth day will always be changing. Are there any proposals to establish a standard time unit based on something that does not change - like the rate of decay of some radioactive element? 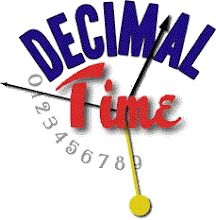 Then, we would need a decimal time system that allowed the day to get longer, but still give us a sense of percentage. Would it be human if the day had 1001 millidays? There is a unit of metric time, the second, which is defined by the vibrations of some element, based on the length of the day in 1820. This is not a problem with decimal/metric time, but for any time of day system. We already deal with it, using leap seconds. There are other solutions, as well. But the difference is not so much as a milliday but merely two milliseconds. Considering that mean time can be as much as a quarter-hour off from where the sun actually is, that standard time zones can be over a half-hour different from local mean time, and that many places shift the time back and forth a whole hour every year, I don't think that humans are going to notice a few nanodays.